Last year I wrote a few posts (here and here) that talked about how skewed venture returns were. 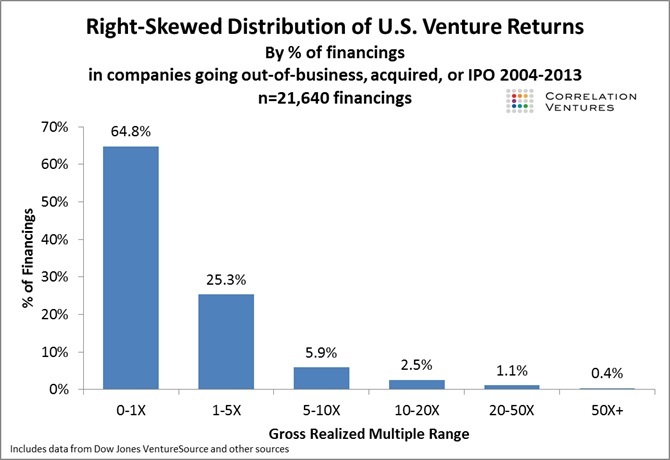 The key take-away graphic from that post is below – outsized returns on venture investments are rare. Much rarer than most people realize. A key question my post didn’t consider was what the ideal venture portfolio might look like in the face of these data. 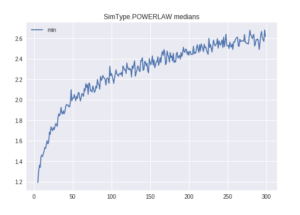 Steve Crossan took a stab at modeling the answer to that question using the data from my Outcomes post. It’s an interesting read – you can see his full analysis here. Interestingly, we pondered this exact question at the very start of Foundry Group. Nassim Taleb’s book, The Black Swan had just come out and we decided to read the book and discuss its implications for the venture firm we were about to start in late 2006. I imagine many of you have read the book (if not, I’d highly recommend it) – the basic premise is that humans do a poor job of understanding the likelihood of unusual or improbable events.Black swans are rare but just because you’ve personally never seen one doesn’t mean they don’t exist. Compounding this error, humans are also poor at understanding the causes of these unlikely events after they take place (we misattribute their causes and as a result continue to make poor judgements about their likelihood of reoccurrence). The robust dinner conversation we had back in 2006 essentially asked the question: “If venture outcomes are Black Swans, what does the optimal venture portfolio construction look like?” Steve asked a similar question in his analysis, which tries to use a simulation model (actually thousands of them) to construct hypothetical portfolios to see what the resulting returns look like. We obviously didn’t have the benefit of the data that my original Outcomes post relied on, but having already been in the venture industry for a while we knew that venture outcomes were relatively rare. In the end, we came to some similar conclusions as Steve did on one end of the portfolio construction scale but our views diverge as the portfolio size gets larger – more on that below. It’s clear from the data (and from common sense) that every venture firm needs to place enough bets to expose themselves to outsized successful companies. With a small number of investments your chance of a winner is too small and your bets are too concentrated. That’s true no matter the size fund you’re investing (I’m referring to early stage funds here but a version of this is true even for larger, later stage funds; although a higher level of concentration in later stage funds is actually helpful). This is similar to the advice I give to angel investors as well. Diversification is clearly important in venture investing – you can see that from in the graph below from the steep slope on the left side of the graph (which shows on average very poor return multiples for funds that have a small number of portfolio companies). But is too much diversification a bad thing? Here’s where I think math fails practical reality. Given the rarity of outsized returns (the data from my original post surprised many) a purely theoretical model such as the one Steve ran suggests that the optimal strategy to exposure yourself to outsized outcomes almost has no cap on the number of companies one should invest in (again see the 2nd graph – the slope flattens, but still rising, as the number of companies increases). I think we intuitively understood this back in 2006 and the cruz of our debate centered around just how diversified should a portfolio like ours be. On the one hand there is clearly some benefit to being exposed to a large number of companies. On the other hand it’s not practical to manage that many relationships and we believed there was benefit to knowing which businesses to continue to support and which ones not to. Additionally there is benefit to concentrating ownership in your best performing portfolio companies – something a firm can’t do if it’s spread too thin. It’s a discussion we continued to have throughout the history of Foundry, in our case settling on ~ 30 companies per fund (each of our early stage funds is $232M in size). We felt like that struck the right balance of capacity, ability to concentrate ownership, ability to continue to back “winners” and, frankly, the kind of relationships we wanted to have with our portfolio. That said, I imagine there’s an argument to be made that 30 is still too concentrated for a fund of our size – we debated this vigorously back in 2006 and still talk about optimal portfolio construction regularly. Certainly there are examples of funds like ours that invest in more (or in some cases far more) companies than we do (FirstRound Capital comes to mind as does True Ventures). And, of course, there are many examples of similarly sized funds that have the same or even greater concentration than our model. I’d also note that the earlier stage a fund invests the less concentrated I think it should be – the earlier the investment the larger the distribution of outcomes. And similarly, the smaller a fund is the less concentrated it should be as well – lacking the ability to continue to invest across rounds (and therefore to meaningfully concentrate ownership in clear winners) the more diversified the initial investment set should be. As a student of venture math, I love these sorts of questions. I’m sure we’ll be debating them for years and years to come.